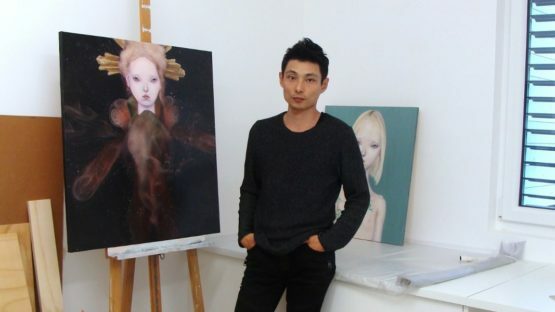 Born in Japan, educated in England and based in Switzerland, Teiji Hayama is a highly talented mixed-media artist known for his alluring portraits of female creatures. His beautiful, supernatural subjects, between girls and woman, nymphs and goddess, are inspired by both ancient and modern, traditional and eccentric. Luminous skin and sensual bodies of nearly naked young ladies capture the viewer with their beauty, charm, and grace leaving no one indifferent. Teiji Hayama’s paintings have been included in many exhibitions and art fairs from Los Angeles and Amsterdam to Singapore. The painter obtained his degree from the Central Saint Martins College of Art and Design in 1998. He began his career as a male model featured in many notable international magazines. However, after working for several years in the fashion industry, he felt the urge to get back to what he loves most – painting. 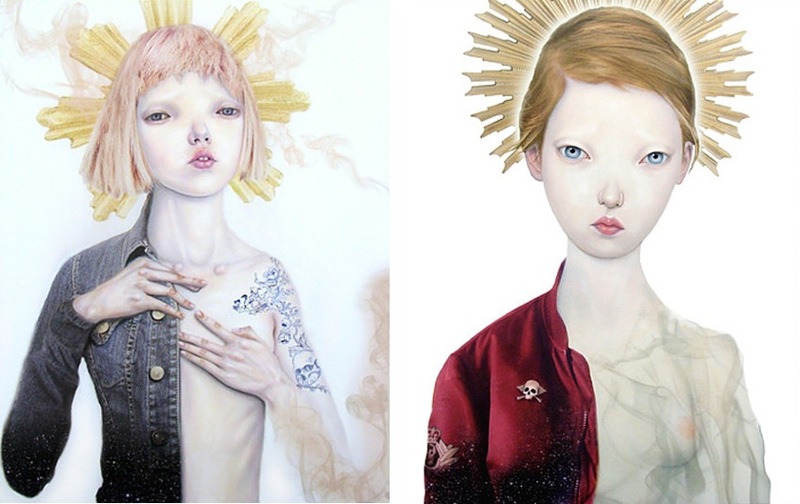 From then on, Hayama has developed his unique style of painting often portraying young females on the verge of becoming women. The pubescent girls in his work are characterized by pale white skin, thin lips and seductive bright eyes fixed on a certain spot. His subjects remind us of the importance of time and life, while also representing young but world-weary, fragile girls evolving with all their doubts, fears and worries in an increasingly hazardous world. Hayama’s captivating compositions inspired by the legends, Greek mythology, Christianity and Japanese pop culture have been exhibited in galleries throughout the world. His work was included in group shows at such galleries as Galerie Geraldine Zberro in Paris, CHG CIRCA in Culver City, CA, and Pink Zeppelin Gallery in Berlin. Solo shows were on display at Stephen Romano Gallery, Brooklyn, Thomas Punzmann Fine Arts, Frankfurt, E¦C Gallery, Chicago, Galerie T40, Düsseldorf and Willem Kerseboom Gallery, Amsterdam. His painting entitled Madone, was selected by Madonna and curated by Katy Perry on May 13, 2014, on the Art for Freedom website, the global digital initiative designed to encourage creative expression that brings awareness to human rights violations. Having work included in collections in France, Germany and Australia, and featured in many publications and art magazines, Teiji Hayama is nothing less than a truly distinguished artist. Teiji Hayama lives and works in Switzerland.